Pride's remorseful statement wasn't sent to those who needed to hear it most. 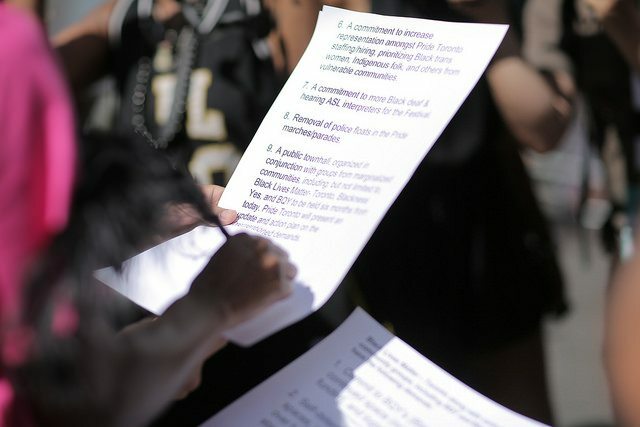 List of demands signed during this year’s parade. Photo courtesy of Pride Toronto. Apologizing isn’t hard. Even children know the right way of saying sorry involves sincere remorse and a willingness to pick up the pieces. At first glance, Pride Toronto did just that with their latest statement that expresses regret for a history of anti-Blackness and various community missteps. But it might have helped if Pride Toronto actually apologized to those most directly affected. Black Lives Matter Toronto representative Hashim Yusuuf told Vice the apology was never sent directly to members of the group; they instead stumbled upon it on social media. Pride Toronto members were not sent notifications of the apology either, but this oversight could be attributed to reduced resources following the recent departure of Pride Toronto communications manager and media contact Victoria Schwarzl. For whose benefit is this digital and faceless apology? Signed off by the board of directors as a singular entity, much of the statement consolidates various unrelated issues. It cushions regret with references to successes running this year’s Trans March, sober spaces, and a health zone. A snide remark about financially broke Prides in other cities and a World Pride shout-out were strangely present in the statement, too. Parts of the statement that are relevant have already been voiced at the widely reported town hall meetings. The statement says the dispute resolution process, originally created to handle Queers Against Israeli Apartheid’s controversy in 2012, will be the deciding factor on police participation. This is in spite of Pride Toronto’s statement re-affirming its commitment to meeting all nine demands raised by BLMTO’s sit-in, the eighth of which asks for police booths and floats to be removed from all marches and community spaces. More contradictions are present: Pride Toronto makes a notable effort to repeatedly describe its failures to fulfill the needs of Black locals (of which, it can’t seem to settle on whether they’re black, Black, or “Black-identified”). In a sorry-ridden paragraph, Pride Toronto apologized for anti-Blackness enacted by the organization itself. A few sentences later, it apologizes for any hurt feelings from local law enforcement. As police brutality against Black lives is ongoing—fathers Terence Crutcher and Keith L. Scott were both murdered by U.S. police this week—this soft admission of guilt could have openly addressed and comforted its honoured group, one chosen for its activism and advocating safety for those rightfully scared of police. But the statement serves more as a press release for posterity. Challenging institutions we want to love hurts. It hurts to know former executive director Mathieu Chantelois will not be held responsible for any part of this. It hurts to see Pride Toronto, even in saying sorry months after damage was done, failing to fess up in the right ways. No one wants to forgive anyone who is prone to subject changes, can’t decide what to call you, or flip-flops on their positions. At least Pride Toronto takes responsibility for screwing up—but even this comes without many solid solutions for addressing the anti-Black vitriol it apologizes for. In a step more tangible than the majority of Pride Toronto’s statement, Yusuuf told Vice Black trans women should be on the board of directors. Board member Biko Beauttah proposed a similar result, telling media after the first town hall in August she hopes to see a trans woman of colour as Pride Toronto’s new executive director. And for all its fault, at least the statement highlights next steps for concerned community members. The annual general meeting, open only to its membership, will take place in the near future. (For reference, past meetings have occurred in late October.) Four board director positions will be up for grabs. This meeting will be followed by a public town hall in the winter.